Rustic or Themed Photo Booth Hire. 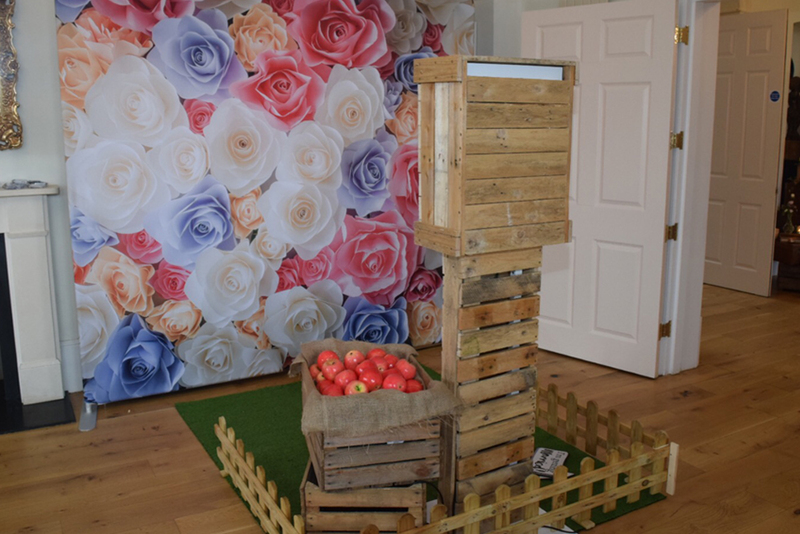 Rustic or Themed photo booth hire, made from pallets with fake grass and picket fence setting along with the wooden crates and apples to hide the printer. It can come with either one of our backdrops or green screen. Using a Canon 600d camera that is set up for the best possible instant results. This packs away very small and no lift access is required. Click HERE to see if we have your date available and what options we have to book. Click HERE to contact us about any questions you might have. This rustic photo booth hire includes unlimited visits to the booth, instant double 6×4 prints (or strip 2×6), personalized guest book, online gallery, props, green screen and an attendant to run the hire. There is a unlimited option, where you can have unlimited prints so every guest will receive a 6×4 print plus one for your guest book, this is an extra £50 for this option. Add a USB for an extra £15 and have a digital copy to hand. A great add on to booking our photo booth, let us take all the stress out of making the wedding favours. Key ring keepsakes, come in a little gift bag matching your chosen colour scheme. In addition with your names on the back and a little message inside saying “Keep me safe, you’ll need me later”. Therefore they must be pre-booked because they are made to order and handed to either you or the venue. The staff at the venue can place them on the tables so all your day guests receive one each. Then later on when the photo booth starts, the guests come up and have a picture taken and we cut out the photo and put inside the key ring for them.